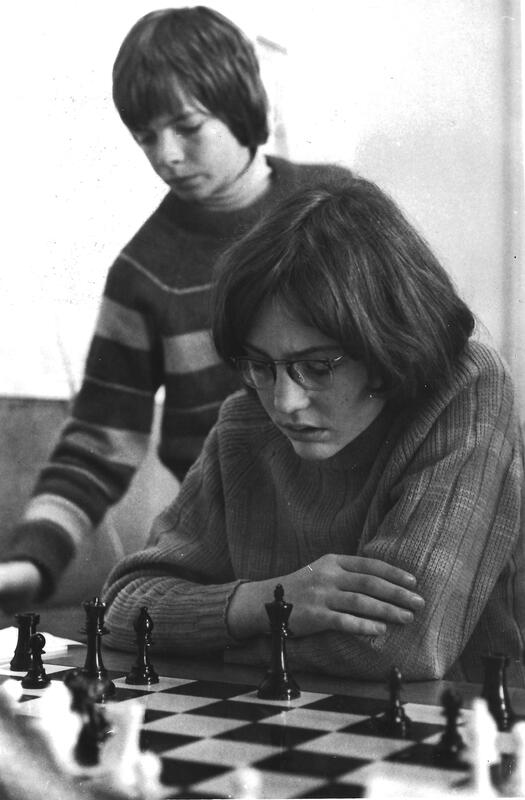 Having followed the 1972 Fischer – Spassky match from the newspaper articles that printed the game moves in full detail (something that would never occur today), I joined the Otago Chess Club in 1974 and started competing in their regular tournament events. A benefit in those young days was the fact the chess club met on Saturday nights, thereby being allowed to stay out late as no school the next day to worry about. My first venture into national competition was the 1974/75 Premier Reserve event held as part of the centennial celebrations of the Otago Club. A credible score of 5.5/11 was achieved. The Otago Easter in 1975 (3.5/6) was followed by qualifying for the NZ Schoolpupil event as one of the two Otago representatives. As the crosstable shows, this was a harsh lesson in the strength of junior chess in NZ. 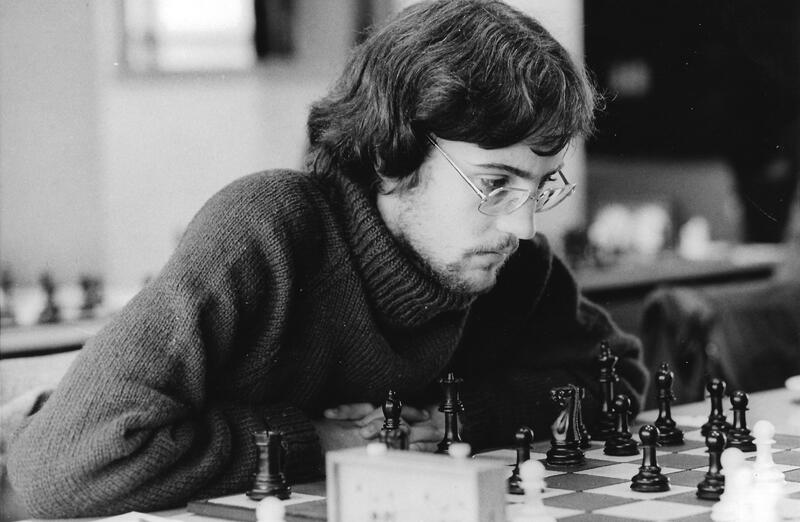 In 1977 I joined the New Zealand Correspondence Chess Association and began an association with that form of the sport that remains until today. My early results went well, 2nd= in TT2 in 1977/78, winning the TT reserve in 1978/79, and my first NZ Championship with 12.5/14 in 1979/80. A second title was gained in 1983/84 with finishes of 2nd or 3rd in the intervening years. The correspondence games helped me develop a strong theoretical opening background in a period when computer databases did not exist and allowed some reasonable if not spectacular results in “over the board” OTB chess. This culminated in being selected in a weakened NZ team to the 1983 Asian Teams event in India, the report of this event is available in the history section of the website. Returning to NZ battle hardened I had my best ever OTB result, winning the NZ Premier Reserve with a 9.5/11 score, and qualifying for the NZ Championship the next year. It also saw me invited to play board one for a composite team at the Asian Cities in Hong Kong, also covered on the history pages. 1984 was the start of playing overseas correspondence chess, a form that has moved over the years from post to email to webserver, with the timespan of games reducing from around 5-7 years to 2-3 years to around 2 years now. An IM norm on board two for NZ in the Pacific Area Team event, scoring 6/8, followed by winning an IM norm event with 7.5/10 saw ICCF award me the IM title in 1995. 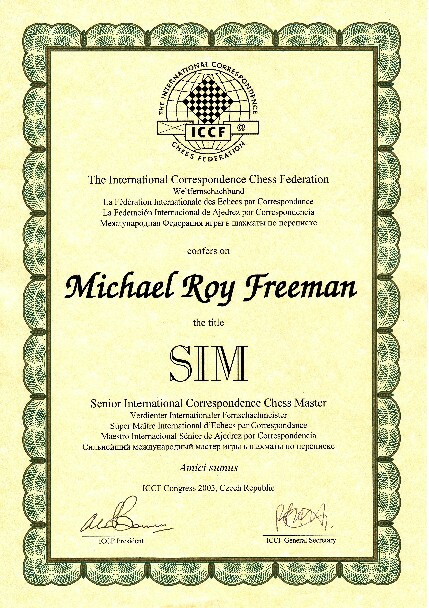 Further success, including winning the 50th ICCF anniversary event for officials with 11.5/14 gained the ICCF Senior International Master (SIM) title in 2003. My first, and to date, only Grandmaster norm was gained in the fifth edition of the PATT event, playing on board one for a joint NZ/Australia team. Olympiads, Other Overseas Events and FIDE. In over the board chess my play levelled out around the 2200 strength, and relocation for work to a rural part of New Zealand diminished opportunities for regular strong opposition. A good result was gained in the 1991 US Open with 8/12. In 1993 I joined another NZ team to the10th Asian Teams in Malaysia, scoring 4.5/7 on board four. Another trip to the 11th Asian teams in Singapore 1995 on board three scoring 4/9. In 1994 I was invited to fill the role of team captain and manager for the NZ team to the Olympiad in Moscow. Who could say no to a trip to Russia, then the centre of strong chessplayers, and a country recently opened up to western visitors. I subsequently filled the same role at the 1996 Olympiad in Yerevan, Armenia; 1998 in Elista, Kalmykia; and 2000 in Turkey. The 1996 event saw me having to also play two games. 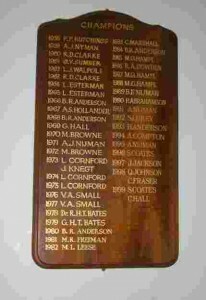 The 1996 and 1998 events are described on the history page. 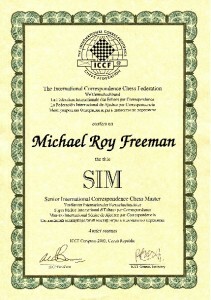 From 1996 I became NZ delegate to FIDE, a role I still fill. I was elected to the Asian Continental Board from 1998-2002. Somewhere around the early 2000’s I became NZ delegate to ICCF, thus representing NZ in the administration of both forms of the sport. I was pleased to be able to take two sets of young juniors to the World Youth Championships in 2000 and 2001 in Spain, and especially pleased when Puchen Wang finished 5th in the World Under-10, a great result for a NZ player. You can read more about the Europe Youth Championships here.